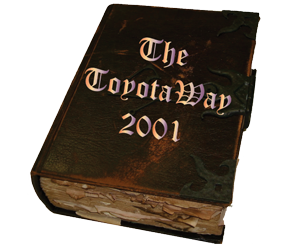 Unlike Jeffrey Liker’s 2004 The Toyota Way, The Toyota Way 2001 is not a publication but an internal company document distributed to US employees, who were not supposed to reproduce it. 12 years on, many consultants are quoting it, borrowing its terminology, and describing it as representing the essence of Lean. It is floating around, but it is still not readily available. If you google it, you find plenty of inquiries about it, but the document itself does not pop up. Unlike the Necronomicon, however, it does exist. It’s only 14 pages long, and probably worked as a “wrapper” for the methods Toyota employees were already using. As a stand-alone document, however, it’s not that useful, as it does not clearly state what is special about the company. Based on its content alone, it would be difficult to tell the Toyota Way apart from other corporate philosophies like the HP way. A manager of a mid-size traditional plant, reading The Toyota Way 2001, would reasonably conclude that all he or she needed to do to emulate Toyota was follow its recommendations. With all the wheels that would have to be reinvented, this approach in such a plant might yield results in, say, 60 years. In his introduction, Fujio Cho, then president of Toyota, describes the document as a statement of the company’s “DNA” and applicable everywhere in the world. The five major headings that follow — Challenge, Kaizen, Genchi-Genbutsu, Respect, and Teamwork — have come to be often used outside of Toyota, for example as a structure to explain why middle managers don’t practice A3 thinking. Except for two quotes by Hiroshi Okuda, who was still running the company in 2001, all the authors were either retired or dead; Okuda himself retired in 2006. With the exception of Fujio Cho in the introduction, the document does not reference any current leader. Eiji Toyoda, the most quoted author, is founder Sakichi Toyoda‘s nephew and will turn 100 this September. The second most quoted is Kiichiro Toyoda, who started Toyota in car manufacturing but died in 1952. The man best known outside Toyota as the father of the Toyota Production System, Taiichi Ohno, is only in 3rd place, with nine quotes. 80% of the quotes are from Japanese sources, and 53% are from three generations of the Toyoda family. Outside of the quotes, the subtitles and the summary paragraphs use terms like “Lean,” “DNA” and “value” that are from the American Lean literature. “Value” is used in multiple senses, sometimes for ethical principles as in “values and beliefs,” and other times as an abstraction of what the company delivers to its stakeholders, listed as “customers, shareholders, associates, business partners and the global community.” The order in the sequence obviously matters, but there is a contrast with the US Lean literature and its exclusive focus on customers. “Value added” appears once, in a definition of Muda as “no value added.” In the Japanese literature, Muda is not defined, and used in its common, everyday sense of “unnecessary.” “Added value” is used four times, and designates a quantity that can be high or low, as in “goods and services with high added value.” While it is not explicitly stated, this usage is consistent with added value being the difference between sales and the materials, energy and outsourced services consumed in producing the goods sold. This is the metric used to compute productivity, contribution to GDP, and Value-Added Taxes in countries that charge them. There is no reference to “value added” as an attribute of activities that customers are willing to pay for. There is a reference to “Optimization,” which surprised me, as I see the optimization mindset is antithetical to continuous improvement. Once you have optimized something, then, by definition, no more improvement is possible. I have heard managers say “We’ve optimized this line…” as a way to say that they had moved on to other areas and would not address glaring problems that remained. With continuous improvement, on the other hand, the completion of an improvement step is not an occasion to declare “mission accomplished”; it just sets up the stage for the next step. Following are comments on a few of the quotes in the document that I found most striking. It builds on the famous Benjamin Franklin quote “Dost thou love life? Then do not squander time, for that’s the stuff life is made of.” (‘Poor Richard’s Almanack, June 1746). But Franklin’s exhortation is for individuals and about themselves. The twist Eiji Toyoda adds is that the company should not squander its employees‘ time, and the reason given is not that it is paid for, as Taylor would have said, but that it is a piece of that person’s life. I don’t recall seeing such an expression of respect for humanity in the American management literature. Taking this further, if we squander an employee’s time, we are also sending a message. We are telling the employee that we can afford to waste his or her time and therefore that it is worthless. And since that is “the stuff life is made of,” the employee’s life is worthless, so that the final message is “You are worthless.” It is difficult to imagine a more disrespectful or insulting stance. Most discussions of respect for humanity in TPS are about making full use of employees’ skills, and, in particular, their intellectual and creative abilities. What Eiji Toyoda says here is that it is also about their time. In Japan, I had heard it said admiringly of Toyota that “they could squeeze water out of a dry rag,” (乾いている雑巾を絞ると水が出る) but I didn’t know it was a quote from Eiji Toyoda. And it was about rags, not towels. I suppose the translator just thought “towel” sounded more professional, but “rag” is more true to life. Eiji Toyoda is also quoted as saying “Why make only software? Software exists only because there is product manufacturing.”To this resident of Silicon Valley in 2013, it is obvious that, even though Photoshop and Netflix are not made of materials you can touch, they are as tangible as goods and services as cars and oil changes. I understand why a man born 100 years ago who spent his life growing the best car manufacturing company in the world would feel that way, but, on this one, I respectfully differ. “The quicker merchandise can be moved from the raw material to the ultimate consumer and the minimum amount of merchandise, of whatever it may consist, involved in the ‘float,’ the more efficient and more stable industry becomes.” Speech to Automobile Editors of American Newspapers, 9/28/1927. Of course, stating a goal and achieving it are two different things. Alfred P. Sloan was the manager who led GM back from near bankruptcy to overtake Ford in the 1920s, become the largest car maker in the world until that position was snatched by Toyota. He knew that JIT was worth pursuing but, for all his management savvy, he was not able to make it happen. The document includes a quote from Alex Warren that describes standardized work as the best known way to complete a job. Art Smalley and Mike Rother disagree, specifically with the notion that this is the way standardized work is used within Toyota. To Art Smalley, the standard is a basis for comparison; to Mike Rother, a target condition. I consider Standardized Work to be just a set of rules published for the purpose of ensuring that different people perform the same tasks in the same way. Because it has to be enforced, it is more than a basis for comparison, and it cannot be a target. While it may be the best known way, describing it as such is hardly a way to encourage improvement. A document of this type about the way a company does business gives employees a framework to understand management decisions and business processes. By definition, the Toyota Way is what Toyota says it is. But the Toyota Way 2001 document is intended to serve a specific purpose for the specific audience of Toyota employees in the US. As outsiders, we must consider it on its own merits and see what use we can make of it as a stand-alone document, taken out of context. My read on it is that it is misleading for readers who are just starting their Lean implementation in that they may believe that all they have to do is continuous improvement with respect for people. Mike – I always enjoy your informative blogs! Great hermeneutics, Michel. Details of this nature matter – the context, intent, audience, and purpose – especially regarding Toyota and its development. Legends and myths arise from documents like this. Thank you for distinguishing the two. Interesting take on the Toyota way. I use the term optimize when discussing Lean and improvement processes. However, I don’t attach the sense of finality you did. I believe a process is optimized ‘at that time’ and can either be waiting for additional improvements or can be revisited again after other, more pressing areas are addressed. I believe you can optimize a process and still address it again later on. Glad to have found your blog and will visit again. Many others use the term as you do. I use it in its strict, technical sense, and the managers who use it to cut off improvement efforts play on this ambiguity. That’s why, when discussing improvement, I just call it “improvement,” and I have not seen any downside to doing so. Thanks for sharing all of this. I’ve been taught that there’s a difference between a standard (which is more like a specification… ala a target condition) and standardized work (how we do our work – “the current best way”). I agree with your observation about the word “optimize.” It is not a word commonly used by Toyota people back then. I think it is likely a translation error. Finally, I think the value “The Toyota Way 2001” document to outsiders is to strongly reinforce a fact long known by those who have succeeded in their practice of progressive management. That is, both principles, “Continuous Improvement” and “Respect for People” are required in order to achieve flow. The mistake that so many people have made in the past, and still today, is that they will be able to achieve flow using only continuous improvement. Seneca’s “On Shortness of Life”: | My notes... Quality, Data Science, Strategy & Lean.